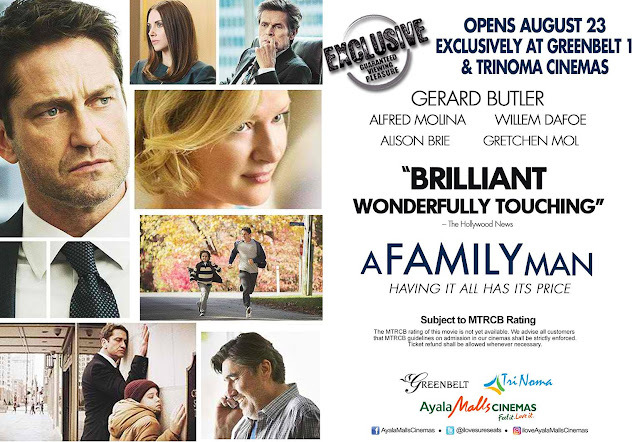 Opening exclusively at Ayala Malls Cinemas’ Trinoma and Greenbelt 1 screens starting August 23, “A Family Man” is a family drama that deals with real-life dilemmas. A simple, elegant and classic throwback movie about a deeply touching father and son relationship. Key to the films’ emotional highs is Mark Isham’s music used in the movie that heightens the emotional journey of Gerard Butler’s character, Dane Jensen. The electronic and ambient half of his score, inspired by the groundbreaking music of Brian Eno, complements the modernity and commerciality of Dane’s work-life and its complicated but invigorating morality. As Isham reflects, he was seeking to convey “the fun and challenge Dane experiences at work.” His electronic score manages to be sleek, propulsive, and unsettling. Early in the film, when Dane makes a questionable decision, the score refuses to indicate whether this was a bold move or an ugly mistake. The percussive electronic notes build and build tension and momentum—before breaking into silence. As “A Family Man” goes on, and Dane’s family life begins to overwhelm his professional, Isham allows strings to layer in and over the electronic soundtrack. As Isham explains, while he uses the electronic elements to “give it a contemporary feel, the string quartet brings it straight to the heart.” When Dane’s story reaches an emotional crescendo, the strings take over the soundtrack, crafting a moment of clarity and joy. Like the film, the score walks a careful line that is unafraid of the intimacy of its characters and themes but still restrained and real. “A Family Man” is an Ayala Malls Cinemas exclusive that will open in Trinoma and Greenbelt 1 screens on August 23.